ARCHIVE SERVER & VBC TIMELINE The Archive Server provides data recording capacity in a simple connect-and-forget form. When connected to the VBC controller and configured through a simple setup routine, the Archive Server automatically activates the VBC's Timeline analysis capability for an enormously powerful new way to analyse historical data in depth. It's a new graphical data analysis technology that allows users to play through recorded data in an NLE-style Timeline display to observe correlations and patterns of errors occurring over any time period. Users can scrub through the data at any point in the recorded archive, opening and collapsing data tracks, and zooming in to observe fine detail on all the visible tracks. The Timeline shows content thumbnails, alarm markers and all the metrics familiar from the MediaWindow™ displays, making visual navigation through the data simple and quick. Users can drag and drop data tracks to group them in any order for convenience. Engineers can search through the chain of events that led up to service failures, and generate reports for remedial action or fulfilment of regulatory SLA obligations. The Timeline functionality enables operators to go back and explore, understand, verify and document in complete detail what happened at any given time, or look for patterns over longer periods of time to identify and eliminate problems. The Archive Server and Timeline capability also simplifies detailed and comprehensive reporting for regulatory verification of closed caption conformance, loudness, SCTE35 signalling, RF trending and other parameters. 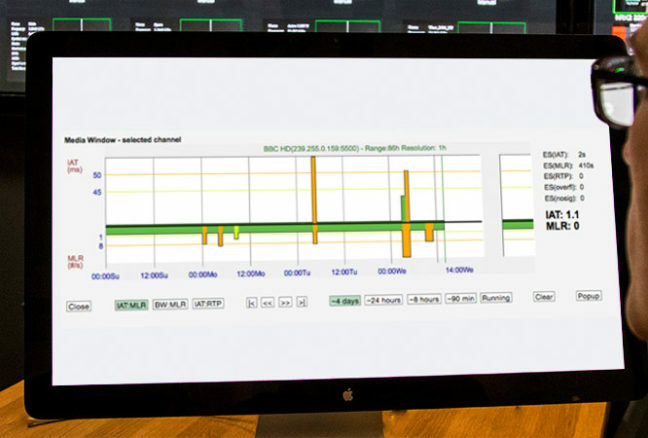 The easy-to-set-up archive server units can be added quickly to any Bridge Technologies monitoring system, and subsequently function without further attention.